You may notice that a tar and gravel roof is installed on many low slope or flat roof commercial buildings. Contractors and builders use gravel on flat roofing for two primary reasons; the first is to protect the underlying layer of roofing materials on built-up roofs (BURs), and the second is to secure or weigh down the roofing material, as is the case with single ply flat roofs. What Are Tar & Gravel Roofs or Built-Up Roofs? Built-up roofs or BURs (also called a tar and gravel roof) is a well-established and popular style of flat roof that is made up of alternating layers of roofing felt or fiberglass and asphalt that is applied with heat, which combine to make a long-lasting sturdy roofing system. The gravel embedded on the top coat of asphalt (the flood coat) protects the underlying layers from the elements, including ultraviolet rays and natural threats like hail storms or heavy rains. Various types of BURs require a different type and weight of gravel depending on the underlying layers, the structure of the building, and the climate of the location. Even though the asphalt waterproofs the roof (highly important for flat roofs where water and moisture can build up instead of draining off like it does on a sloped roof), the gravel layer extends the life of the roof. 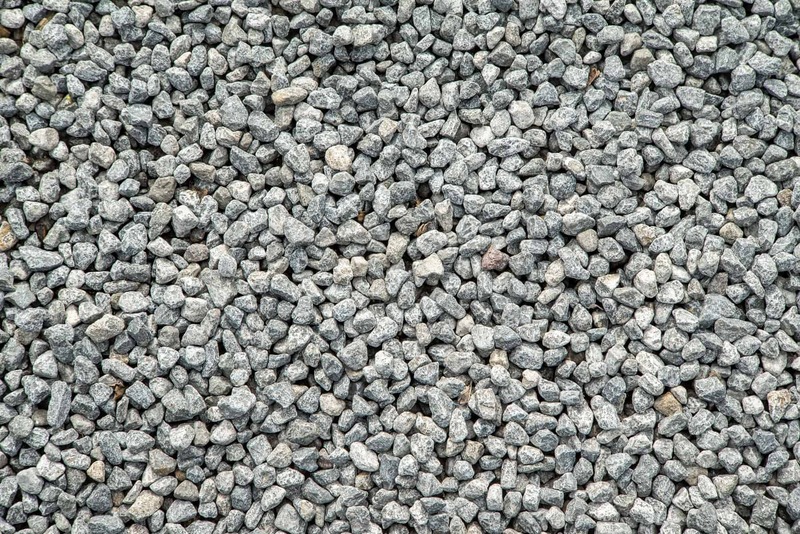 Note that the “gravel” is usually some sort of aggregate material like pea gravel, slag, or mineral granules that are pea-sized and about a quarter-inch thick, and serve the purpose of satisfying the Class A surface burning designation. Why Install A Tar & Gravel Roofing System? The benefits of a tar and gravel roof are numerous. They tend to have a lifespan of around 20 to 25 years depending the location and the structure of the rest of the property (barring any major natural disasters of course). The weatherproofing aspects of the gravel embedded in the roof can prevent degradation like cracking or blistering that lead to leaks or other failures over time. 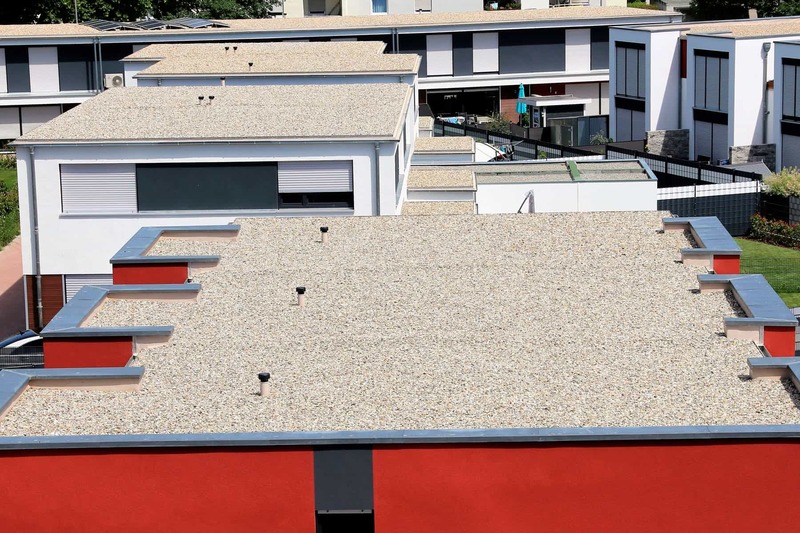 There are two main types of BURs or tar and gravel roofing systems, modified bitumen roofs which are a mix of asphalt and rubber with a layer of gravel on top, and ballast roofing, which is a different style of larger gravel applied on top of a single ply roofing system. 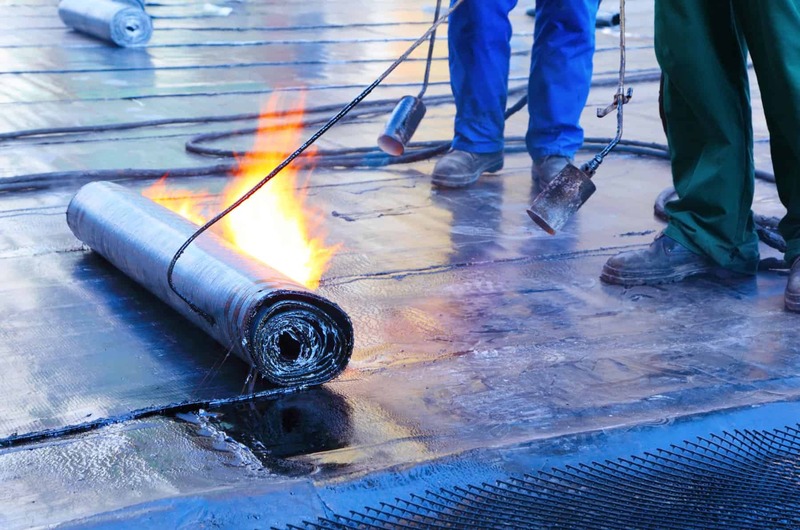 Bitumen roofing systems are built up when modifiers are added to the typical roofing asphalt, replacing plasticizers removed during the distillation process. It is then reinforced with fiberglass or polyester fiber matting in order to increase its durability and strength. The two most common types of modified bitumen roofing are SBS (styrene-butadiene-styrene) and APP (atactic polypropylene). SBS improves the flexibility of the roofing membrane, giving it stronger expansion and contraction capabilities, while APP improves the ability of the roofing system to stay strong as it ages. Each type is popular in different climates and applications – an experienced contractor in your region will be able to advise you as to the right choice for your property. The reasons to choose a modified bitumen roof are many. The gravel holds and releases heat and helps to improve water evaporation, keeping both heat and moisture away from the underlying layers. 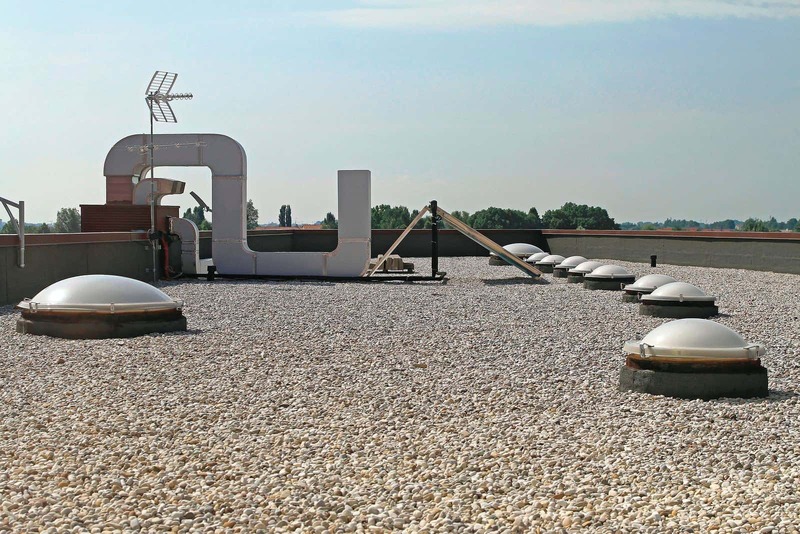 The looser gravel helps to provide a better grip for foot traffic when your team has to access the roof or contractors are performing maintenance and repairs on your bitumen roofing system. Note that the gravel on modified bitumen roofing systems must be kept fairly even on the roof at all times, and some of the gravel must remain loose to prevent damage or punctures from foot traffic. On the other hand, ballast roofing might be the right choice for your commercial property if you live somewhere with a ready source of ballast (rocks/gravel of the appropriate size) and you prefer the aesthetic look and texture of the larger stones. Paving stones can also be added to create walkways, which adds value to your property. It’s fire resistance (ballast roofing offers Class-A fire resistance without the need for gypsum underlayments or expensive fire-retardant chemicals), sustainability, and ease of repair (since the ballast stones aren’t actually embedded in the membrane, they can be easily removed and the membrane repaired as necessary), and overall energy efficiency make ballast roofing systems a popular choice in many areas. Properly maintained tar and gravel roofs can last several decades. A roof can be strengthened or further built up by adding more layers to the roof like additional fiberglass or foam to increase its insulation; what’s more, applying a new acrylic or elastomeric “cool roof” coating can help to further weatherproof your flat roofing system. Repairing a tar and gravel is of course best left to the professionals, and since a properly maintained BUR roofing system can last for decades, chances are you will have to repair your roofing system at some point during its existence. Leaks and other damage to tar and gravel flat roofing systems are repaired by patching the roofing membranes. 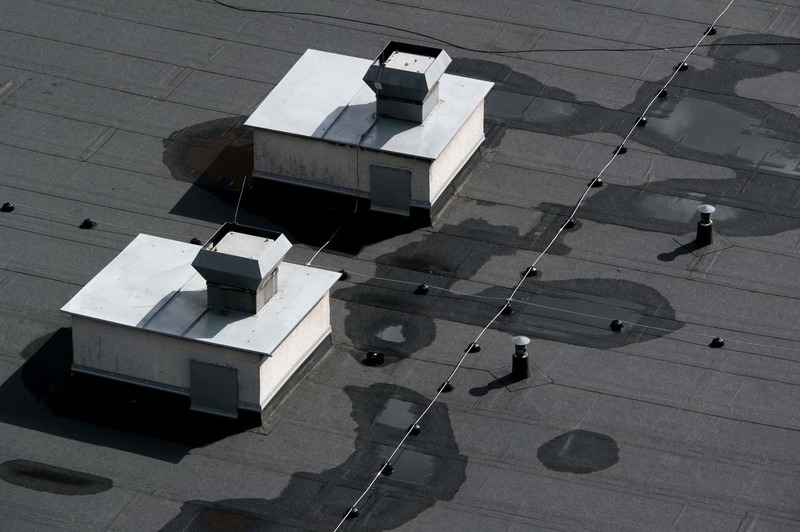 That said, if you’re evaluating an existing tar and gravel roof on a commercial property that you are considering purchasing, note that many leaks may indicate a significant amount of past leaks and weak areas, which are undesirable for obvious reasons. You can and should always consult with your public adjuster/building inspector and local contractors before acquiring a new property. After all, if the patches were not done correctly by experienced professionals familiar with these types of roofing systems, these areas are more likely to leak again, especially if your region experiences large amounts of rain or natural disasters like hurricanes, floods, and hailstorms. Most experts tend to say that if that if more than twenty-five percent of a tar and gravel roof is covered in patches, than the roof needs to be entirely replaced. What’s more, if you are considering buying a property with this type of flat roofing, walk on the roof yourself to see how it feels under your feet. Things like loose areas, depressions, cracking, discoloration, blistering, and other deteriorated surfaces are all indications that this roof will likely need to be replaced sooner rather than later, so it is up to you if you think it’s worth the investment. While tar and gravel roofing or built-up roofing systems have many positive aspects, if you live in an area or the roof is in a location where it will receive strong sun exposure, hot tar roofs will likely damage the roof’s membrane if it is left uncovered or unevenly covered by the gravel. It is also not typically recommended for areas that receive large amounts of snow or rain, since extreme precipitation can cause significant damage as this type of roof is more prone to leaks, particularly if the underlying layers and flashing were not installed properly to begin with. This is because flat roofing is prone to something referred to as “ponding”, which is when water pools and stays on a flat roofing surface for more than forty-eight hours, forming a “pond” which places increased weight on the roof. Ponding can change the roof’s overall structure, causing depressions and affect the drainage slope which causes the ponding to continue, increasing the likelihood of more damage. Ongoing pooling or ponding can result in vegetation and mosses as well as mildew growing on the roof surface, which can lock in moisture and cause further deterioration. An adequate drainage system can prevent this problem, but it is still not always recommended to install a tar and gravel roofing system in an area that receives high levels of rain or snow. As always, check with local experts like your public adjusters when seeking this kind of advice. It all starts with proper documentation. No matter which type of roofing system you choose for your commercial property (or the one that you happen to end up with based on the previous owner’s choices), you should document the condition of the roof from the outset, and regularly update that documentation. 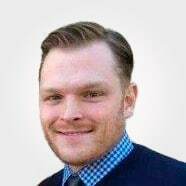 It’s as easy as going over everything with a smart phone and taking pictures and video, and uploading those images and video files to several secure locations (think an external hard drive and the cloud). This is because if a natural disaster or significant damage of some kind happens, you have proof of the prior condition of your built up or tar and gravel roof, which will make your upcoming insurance claim much easier to process. You will thank yourself – and your public adjuster will thank you too – later. Getting a new roof installed is a major investment, especially in the case of tar and gravel flat roofing systems which many require significant maintenance or tar roof repair over the course of their existence, which can extend for several decades. Which is why it is recommended you work with your public adjuster in advance of your claim, getting all your questions answered before you start to repair or rebuild your roofing system.